Diagnosing the exact cause of failure at AirAsia Japan, which will end operations with that name on 31-Oct-2013, is subject to opinion of joint venture partners AirAsia Berhad and All Nippon Airways (ANA), as well as third parties. But most would agree that there have been fundamental structural problems. Many of the challenges have faced not only AirAsia Japan but also Jetstar Japan and Peach Aviation. Some problems were spotted in advance and intentionally avoided by peers. Collectively, they point towards LCCs having a long-term future in Japan but only under the right circumstances. AirAsia Japan’s troubles stem from its ownership structure that gives ANA majority control; something that a Japanese carrier does not have in Jetstar Japan or Peach. This allows LCC professionals, not legacy managers, to run the airline. All of the other AirAsia affiliates have local partners from outside the full-service airline sector. AirAsia is not able to own a majority of any of its affiliates outside Malaysia but it has cooperative partners, allowing the group to make sure the AirAsia LCC DNA is embedded with every new carrier launched. ANA was AirAsia's first full-service carrier partner and will almost certainly be its last. AirAsia was also too bearish in the globalisation of its product, ignoring local distribution systems as well as Japanese nuances that it is now turning towards – supporting the theory of "glocalisation". This is somewhat surprising as AirAsia previously learned a similar lesson in Indonesia, where its affiliate in the initial years struggled as the group ignored local nuances including the need for a local distribution solution. ANA Holdings announced on 25-Jun-2013 its board had decided to dissolve AirAsia Japan and acquire AirAsia Berhad’s stake in the JV. The carrier becomes a wholly-owned subsidiary of ANA but will continue to operate under the AirAsia brand until 31-Oct-2013. The JV was set up with ANA holding 67% of the voting shares and 51% on a capital basis. ANA says the impact of the dissolution of the JV on ANA Holdings will be limited. Meanwhile the AirAsia Group is understood to be looking for a new Japanese partner which would allow it to maintain a presence in the Japanese domestic market. Mr Fernandes added that if the two companies fail to reach an agreement, “then we’ll have to part ways”. Now Mr Fernandes has demonstrated that. AirAsia, less than two weeks prior to the dissolution, formally said in a statement: "Since its launch in 2012, Japan AirAsia has failed to track its proposed business plan due to the inability to manage costs but has seen customer adoption increasing as the AirAsia brand starts to resonate in the market. AirAsia continues to be optimistic and committed to Japan and sees the potential for a low cost airline to thrive in the market and would not rule out any options to make this happen, including dissolution of the joint venture." See related report: The AirAsia joint venture stumbles. Can LCCs survive in Japan? As CAPA previously reported, AirAsia Japan incurred a net loss of MYR97 (USD31 million) million in calendar 2012 and MYR67 million (USD21 million) in 1Q2013. In the previous quarter, 4Q2012, AirAsia Japan incurred a significantly smaller loss of MYR40 million (USD13 million). AirAsia Japan currently operates only four A320s but had been planning to expand its fleet to seven aircraft by the end of 2013. There was an approximately 5% increase in AirAsia Japan's 1Q2013 seat capacity compared to 4Q2012. 4Q2012 also had the advantage of being a busier travelling season. But AirAsia Japan was clearly struggling. The carrier reported only a 70% load factor in 1Q2013. 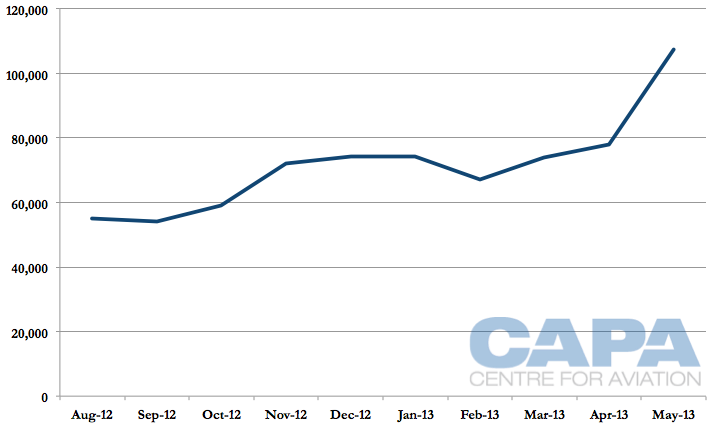 The situation was only getting worse with its load factor reportedly slipping to 56% in Apr-2013. Even during the Golden Week holiday in late April and early May, which is one of the busiest travel periods in Japan, AirAsia Japan reportedly had a load factor of only 68%, compared to 91% for Peach and 79% for Jetstar Japan. AirAsia Japan differed from Jetstar Japan and Peach in that it was established with just two partners, the AirAsia Group taking a 49% stake and ANA 51%. The JV, like others before it, stems from near universal restrictions on foreign ownership of airlines. Without those, AirAsia Japan would have gone for majority control. Jetstar Japan and Peach were established with Japanese airlines, too: Japan Airlines for Jetstar and ANA (also) for Peach. But in those structures the Japanese airline had a minority share. Peach was vocal about how its structure was no coincidence and very intentional: although ANA was welcomed as a partner, Peach did not want to give majority control to ANA. Peach saw ANA running a highly successful premium airline but also one that was bloated and inefficient, giving rise to little cost-saving experience at ANA. Peach’s fear was that ANA, if given control, could not run an LCC on a low cost. Its evidence was the anecdotal example of ANA staff who came to work for Peach proudly displaying their calendar of whose turn it was to take out the office trash, demonstrating their LCC attitude. But far more impact cost-saving measures were either lost or difficult to implement, such as having a cabin crew member open an aircraft door, rather than requiring an (expensive) engineer. Peach quietly expressed these concerns before AirAsia Japan even launched. Peach’s foresight is impressive, adding to its credentials of having – so far – the most successful Japanese LCC. Peach is not publicly displaying schadenfreude, but no doubt it feels vindicated – and perhaps surprised that AirAsia-ANA tensions are so strong that the airline may very well collapse or undergo a radical change. After ANA consummated its marriage with AirAsia, many doubted if ANA would keep both its LCC projects for the medium to long-term. The most logical scenario initially was AirAsia Japan acquiring Peach and merging the two carriers under the AirAsia Japan brand. It seemed Peach’s base at Osaka and fleet of A320s would neatly be folded under the stronger AirAsia brand. Peach launched as an unknown. But now ANA is looking at the option of having Peach take over the AirAsia Japan operation, including its bases at Tokyo Narita and Nagoya, and fold it under the Peach brand. The result would be a stronger Peach, allowing the LCC to accelerate growth and compete even more effectively against Jetstar Japan. Jetstar Japan already has bases at Narita, Osaka and Nagoya. Jetstar Japan has not been as successful as Peach but nowhere near as faltering as AirAsia Japan. The Jetstar Group had the benefit of experience in the Japanese market, flying to Tokyo Narita and Osaka Kansai from Australia (via its original Australian brand). When it went to form the Jetstar Japan team, Jetstar critically paired Japanese staff lacking LCC experience with experienced Jetstar employees, ensuring LCC culture remained. AirAsia also already served Japan through services to Tokyo Haneda and Osaka Kansai operated by sister long-haul LCC AriAsia X. But at AirAsia Japan, where ANA had majority control, AirAsia was restricted in staffing appointments, with further erroneous decisions stemming from that. Jetstar was also advantaged that its partnership with JAL was announced in Aug-2011, a few months after JAL (in Mar-2011) exited a USD25 billion bankruptcy but with memories high and resentful (and still are). This was no ordinary company or even national airline that attracts greater prestige: this was the international symbol of Japan Inc.’s boom – and its bust, as reality caught up with Japan’s high cost base. There was greater understanding at JAL, and those advising it, that it needed to contribute equity and be a part of the LCC scene but be hands-off operationally. Even before Jetstar Japan launched, some favoured it and JAL over AirAsia Japan because it saw JAL taking a lesser role than ANA with AirAsia Japan (or Peach). Jetstar’s process with JAL has been managed through a “flying committee”, a replica of how Jetstar in Australia manages strategy with Qantas mainline to ensure the Qantas Group has optimal profit (Qantas Group owns 100% of Jetstar). Jetstar Japan’s flying committee at times has been as tense as its Australian counterpart, but the formality of it ensures accountability and clear reasons for why decisions are made. At AirAsia Japan, AirAsia only has its anecdotal history (which has been extraordinarily successful in Malaysia with operating profit margins over 20%) to bring to the table with ANA, which at the end of the day holds majority control. AirAsia entered AirAsia Japan (announced in Aug-2011) at a time of flurry, having announced in Jun-2011 a record order for 200 firm A320s and gearing up for the launch of AirAsia Philippines. While AirAsia Japan serving miso soup and having appealing playful advertisements were all in good measure to adapt to the Japanese market, structural decisions were missed. AirAsia Japan did not, for example, support alternative distribution systems like convenience store payments that are prolific in Japan. This was only changed in Dec-2012 when a new management team was brought in as it became apparent AirAsia Japan was falling behind the pack. A critical difference, however, is that AirAsia's load factor dropped to around 10ppt below Jetstar's despite the two having a very similar network strategy. In Oct-2012 and Nov-2012 (latest months for which data is available), AirAsia even dropped around 8ppt lower than ANA and JAL, a somewhat worrying trend, as AirAsia's typical break-even load factor is significantly higher than the full-service carriers. ANA acknowledges it has learning to do about the LCC model, but found arrogance in AirAsia's unwillingness to deviate from what worked in other countries. In Malaysia and subsequently Thailand AirAsia could establish norms and have the population bend to it. But in Japan AirAsia tried to change years of well-embedded – and convenient – practices. AirAsia ran into similar problems in Indonesia after initially deciding to not use normal local distribution channels including travel agents. Eventually AirAsia learned its lesson in Indonesia and recently introduced a local distribution channel as it makes a second stab at domestic expansion. AirAsia would have eventually learned a similar lesson in Japan and will almost certainly pay better attention to local nuances should it decide to establish a new JV in Japan. In a statement AirAsia Berhad faulted the poor performance of AirAsia Japan on the management issues but also its base at Tokyo Narita. The Japanese operating environment is not solely to blame for AirAsia Japan’s poor performance, but its nuances should not be under-estimated for their challenge. Tokyo Narita, like most airports in Japan, has a curfew and AirAsia Japan and Jetstar Japan have found this challenging. About six airports in Japan are open 24 hours, including Osaka Kansai, the base for Peach. Other 24 hour airports are, incidentally, Tokyo Haneda (home to hybrid carrier Skymark) and Kitakyushu (home to StarFlyer, which cites the lack of curfew as one reason why Kitakyushu was chosen). The entry of LCCs has been a learning process for Japan. At Narita (base of AirAsia Japan and Jetstar Japan), the airport had to open the terminal building earlier to accommodate the LCCs' early morning flights (this after years of having regular hours). Jetstar Japan also facilitated the introduction of a special bus route from central Tokyo to Narita that leaves shortly after midnight (after trains stop running) and, after resting along the highway, arrives at Narita in time for early morning flights. The bus was necessary as trains do not reach Narita in time for the first flights from the LCCs. These were obstacles on their own but very minor in the grander scheme of challenges still facing the airline. Japan is hardly as efficient a market as it could be. Mr Murphy cited restrictions prohibiting Peach from boarding through front and rear doors while AirAsia Group head customer experience and technology Zaman Ahmad remarked at the CAPA conference that AirAsia’s typical 25 minute turnaround cannot be achieved in Japan owing to regulations that prohibit Japanese carriers from boarding passengers while re-fuelling (a Jetstar Japan A320 for example could not board and re-fuel in Japan while a Jetstar Asia A320 in Japan could). Ms Suzuki noted Jetstar Japan recently hired a pilot with 8000 hours of experience but noted the pilot still had to complete 24 hours of training. She added different regulators – increasing bureaucracy and negotiations – cover airport runways and terminals. “I’ve never seen a passenger who uses the airport runway but doesn’t use the airport terminal,” Ms Suzuki said light-heartedly. The combined effect has been a hit – well expected – to a LCC’s heart: CASK. “It’s taken AirAsia back a bit,” Mr Ahmad remarked. AirAsia has one of the lowest costs in the world of reporting carriers. The three new Japanese LCCs do not disclose CASK although ANA has previously said that based on a 10 aircraft fleet, AirAsia Japan could have a CASK of JPY6 (USD7.7 cents) in 2013 or 2014. Other regulatory problems include restrictions on the number of sales an airline can have. The LCCs to varying degrees have struggled with a public perception of being late and cancelling flights, which the Japanese media (fascinated with so many new carriers after decades of a near duopoly) dutifully report on. Never mind that when Jetstar Japan cancelled some flights, it covered passengers’ accommodation and expenses even though it was not contractually bound. A discussion on punctuality and cancellation rates (or “completion”, as it is termed in Japan) needs to be put in perspective. The famous statistic is that the cumulative delay of Japan’s high-speed shinkansen trains over a year was only a minute. Railway companies hand out letters to passengers to take to bosses if a train is 10 minutes late. This is not a typical discussion of LCCs being late. While the LCCs are not forthcoming with detailed statistics, Peach says its Mar-2012 to Mar-2013 on-time performance was 81% and cancellation rate 1%. By global standards this is solid performance, but not when comparing the performance of ANA and, to a lesser extent, JAL. 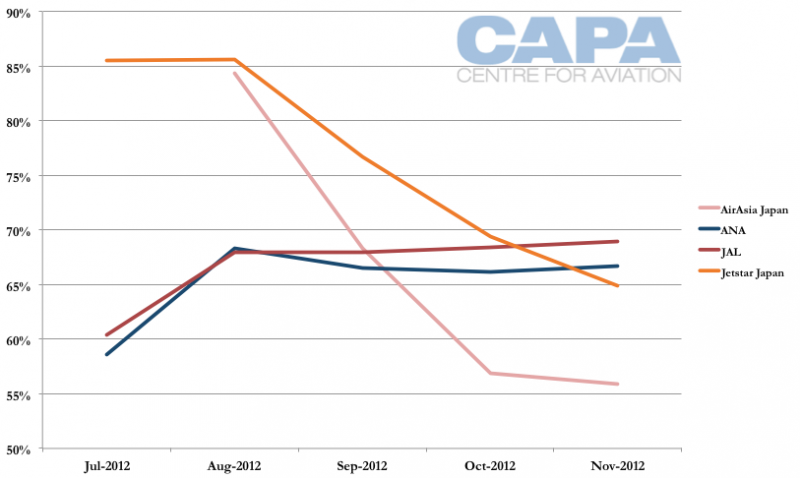 In 2012 ANA had an on-time performance rate of 85.46% while its cancellation rate was 0.22%. This achievement is further underscored by FlightStats naming ANA the world's most punctual airline and being named the airline with the lowest global cancellation rate. JAL's own statistics point to it having an on-time departure rate of 94.1% and cancellation rate of 1.4%. Any LCC is bound to look disappointing next to this stack of statistics. But having such high on-time and completion rates comes at the expense of low aircraft utilisation, high staffing and large, even excessive, technological investments to ensure planes come as close to trains in punctuality. This of course adds to the cost the LCCs are trying to do away it. AirAsia Berhad wanted to present itself as being in the driver’s seat about the future of AirAsia Japan, but it was ANA in control. The incumbent already has an LCC, Peach, and it has proven successful. It would have been in the interest of AirAsia and ANA to come to a resolution that saw AirAsia Japan continue with a sufficient low-cost base, but the relationship was beyond repair. Leaving Japan entirely would surely be a missed opportunity for the AirAsia Group. Japan is the world's third largest domestic market and the market is slowly but gradually adjusting to LCCs. Years of high ANA and JAL service are not forgotten overnight, even if the fares are a fraction. As AirAsia considers a new Japanese partner to re-launch its presence in Japan, there is the scenario AirAsia could re-enter Japan in partnership with Skymark, but this outcome presents its own challenges. The unusual scenario of ANA having no LCC experience and then suddenly having ownership claim to two LCCs resulted from ANA not wanting AirAsia to partner with Japan’s Skymark, an outcome that was very close to eventuating. ANA sensibly reckoned that if there was to be cannibalisation from an AirAsia-branded LCC (after Peach was well announced), it was best to be in control rather than let a competitor be in control. ANA can now run the AirAsia Japan operation under a new name or try to integrate it into Peach, but no doubt Peach would prefer to steer clear. With the AirAsia Group taking the A320s back, ANA will have a LCC without aircraft. The tidiest solution may be to wind the operation up and let Peach expand onto former routes without trying to integrate any of AirAsia Japan into Peach. But perhaps pride will strike – as it so often does in aviation – and ANA will want a wholly-owned LCC of its own, even if it is not truly low cost. As for the AirAsia Group, there is the scenario AirAsia could make amends with Skymark and theoretically launch the LCC they talked about a few years ago. But in practice this would be exceptionally challenging, mainly on the part of Skymark. The carrier sees itself as a full-service challenger to ANA and JAL but with a fraction of their cost base. Skymark is moving further up the premium scale, with outcome to be determined, with all-premium A330s and A380s. Skymark rightly prides itself on not being bloated like ANA or JAL, and despite its management fostering innovation and having cost-conscious success in other sectors prior to Skymark, many have been left feeling under-whelmed by Skymark, seeing that it has not reached its cost base or yield potential. Skymark reported in Nov-2012 that its CASK fell bellow the JPY8 barrier to JPY7.69 (USD9.68 cents). ANA has a CASK of about JPY10, a figure that is flattered by more efficient long-haul operations; matching short-haul for short-haul, Skymark has a bigger advantage. AirAsia Japan's long-term CASK target was JPY5 (USD5.3 cents). Skymark straddles the LCC and FSC cost spectrum. Skymark would have to consider if there could be enough differentiation in cost to support a second brand. Where second (low-cost) brands have flourished, it has been in scenarios where the first brand is premium and at a high cost base, such as Jetstar-Qantas, Scoot-Singapore Airlines. Lack of differentiation is largely where North American legacies faltered in their second brand experiment. In Europe some carriers (British Airways, Finnair) are seeking to reduce their mainline costs while others (Iberia, Lufthansa) are favouring a second brand. There are sticky prerequisites before even considering cost base comparisons. First is if Skymark has the necessary LCC culture to support a low-cost brand; the evidence so far is no, but that it has more experience than ANA. There is also the question if Skymark would want to cannibalise its business with a partially-owned LCC. The cost difference between ANA/JAL and the LCCs is high, but between Skymark and the LCCs it is less. There is a greater chance of a cost-conscious passenger taking Skymark over an LCC than ANA/JAL over an LCC. And finally Skymark and AirAsia would have to find a mutually agreeable ownership structure. Skymark would want its fair share but AirAsia has learned about limiting control. It is obvious that today’s LCC market is different from tomorrow’s LCC market, but in Japan there is a special consideration. Around 2015 the number of slots at Tokyo Haneda is due to drastically increase. Haneda is Tokyo’s preferred downtown airport whereas Narita in some two hours outside of the city, and expensive to reach. Incumbents have been relatively isolated from the effects of LCCs as the Tokyo LCCs (AirAsia Japan and Jetstar Japan) are in Narita while domestic flights from ANA, JAL and Skymark are at Haneda. A true comparison – or pit fight – between the LCCs and incumbents will not occur until the LCCs are at Haneda. The LCCs are not actively discussing this part of their future, but no doubt they have wide eyes on Haneda. If the AirAsia Group can find a way back in and be willing to deviate from the norms of its Southeast Asia approach, then the medium- and long-term offer great opportunities. The spotlight is on AirAsia, but the region's growth is still in its infancy. And there will certainly be financial investors interested in talking to AirAsia.